Situation: CARA often finds herself in interesting situations, surrounded by interesting people. Her goal was to become instantly lovely, gracious and interesting. Idea / execution: In keeping with her tough, but pleasant personality, a bulldog with a pink bow philosophy, cards and simulated scenes were created to help Cara learn – and enjoy – a fresh presentation of herself. An interesting blend of influential people are gathered around a large table to eat, drink and talk – the perfect opportunity for CARA to memorably introduce herself and discuss what she does for a living. man touches turns to gold. Ha ha – Leona you flatter me. (hand kiss) It is a pleasure to meet you. (pause) with a pink bow. (winks and smiles) But friendly. (removes hat) Sorry little lady. (laughs it off) That’s okay. I’m a Production Efficiency expert. I do not know of zis?!? TV production consultation – with a smile. Others chime in on the conversation. 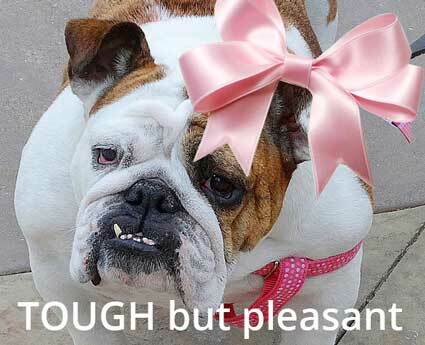 Like a bulldog with a pink bow. I am impressed – more wine!